"Use this book to dip into with a particular question and to reassure yourself that what you are doing is the best possible at the time." "This book is gold for anyone with PD, or a health professional involved in the management of PD... excellent and meaningful information that is easy to find and immediately put into practice... Everyone with PD should have a copy of this book to hand, and every health professional should be recommending it to their patients and clients." "This is the best book I have ever purchased about Parkinson's. My dad has PD and there are a ton of helpful tips in here that really make a difference. If you or someone you know has PD this book is well worth the money." "Excellent book... This book is a must for anyone who wants to understand the disease and who wants to have the best quality of life with Parkinsons." "This book is essential for anyone with Parkinson's Disease at any stage." "Each person deserves to function as best as he or she is able". 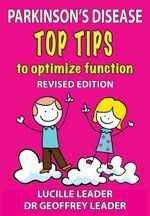 The "Top Tips" offered in this user-friendly book, are distilled from the many years of successful clinical experience of the authors, working together with their pioneering Parkinson's Management Team, in London, UK. It is greatly comforting for people with Parkinson's to know that these really excellent tips can offer simple and effective tools to optimise their function. Presented in "very easy to follow style", the recommendations are responsibly based on sound science or practical experience. This book is a MUST for people with Parkinson's, their Partners and Caregivers to confidently make informed choices in order to optimise general function within the constraints of the illness. Movement Recommendations include Unfreezing, Getting up, Balance, Dance, Movement Therapy, Feet, Hands, Circulation and many others!